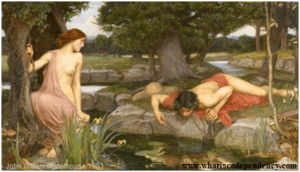 The poignant myth of Narcissus and Echo crystallizes the tragic problem of relationships with narcissists. They were tragic Greek characters in a story told by the Roman poet Ovid in Metamorphoses. Sadly, both partners are locked into a painful drama, where neither feel satisfied or sufficiently loved. Although it’s anguish for them both, the narcissist blames the cause on his or her partner, and sees him or herself as irreproachable, and too often his or her partner readily agrees. Narcissus was a handsome hunter who broke the hearts of the many women. Despite their love, he remained aloof and arrogant. Pridefully, he held them in disdain. Meanwhile, the beautiful forest nymph Echo had incurred the ire of the goddess Juno, who punished Echo for talking too much by depriving her of free expression. From then on, she could only repeat the last words of others. Echo spotted Narcissus and became infatuated. She longed for his attention, but he was fixated on himself. She tried to call out to him, yet couldn’t. One day, Narcissus became separated from his hunting companions and called out, “Is anyone there?” Echo could only repeat his words. Startled, he said, “Come here,” which Echo repeated. Echo jubilantly rushed to Narcissus, but he spurned her, saying, “Hands off! May I die before you enjoy my body.” Humiliated and rejected, Echo fled in shame. Nevertheless, her love for Narcissus grew. To punish Narcissus for his arrogance, Nemesis, the goddess of revenge, put a spell on him. When Narcissus next noticed his reflection in a pool of water, love overtook him. He believed that he’d finally found someone worthy of his love and became entirely absorbed with his own beautiful image, not realizing it was actually himself. Unable to get Narcissus’ attention, Echo’s obsession and depression grew. As the years passed, she lost her youth and beauty pining away for unattainable Narcissus until she wasted away, only leaving behind her echoing voice. He eventually committed suicide, consumed by his impossible love, leaving a flower in his place. Despite their seemingly strong personality, narcissists are actually very vulnerable underneath their protective armor. (See “The Problem of Narcissists.”) Command of their feelings and of other people is all important, because without control they feel weak and humiliated. They’re drawn to someone emotionally expressive and nurturing, qualities they lack. Vulnerable feelings, especially shame, sadness, and fear, are relegated to their unconscious. They have disdain for them or any sign of weakness, which arouses fears of being controlled or humiliated. Thus, to feel sad or lonely evokes their need for someone, which would expose them to hurt, rejection, and feeling inferior. They attempt to eliminate these uncomfortable feelings by demonstrating independence, courage, and strength—ideals with which they identify. Like the myth, narcissists feel superior to others, yet depend upon them to reflect back a positive self-image. Surprisingly, most narcissists are codependent, too. They’re hypersensitive to any perceived challenge to their illusion of being the best, and often perceive slights where none exist. They dread being considered a fraud, having their shortcomings revealed, their opinions or authority questioned, or their self-esteem or pride tarnished. They will do what it takes to prop up their image and block negative feedback. In their arrogance, they can be dismissive and rude, including projecting their shortcomings on others, criticizing and belittling them or unleashing their narcissistic rage. Trying to please them feels thankless, like trying to fill a bottomless pit―their inner emptiness―which they expect others to fill, but of course, it’s impossible. They may embarrass family and friends with their boasting or obnoxious sense of entitlement, such as monopolizing the conversation and interrupting. To obtain what they want, they may exploit others, regardless of the consequences. Their attitude compensates for unconscious feelings of deprivation and inferiority, which become intolerable when they don’t get their needs met or special privileges. Not everyone who falls for a narcissist is like Echo, but those who stay resemble her—a stereotypical codependent who sacrifices his or her own needs to accommodate others. Whereas Narcissus is overly self-absorbed, Echo is overly other-absorbed. Like Echo, partners of narcissists idealize them. They like and admire their bold, take-charge attitude. They, in contrast to narcissists, don’t advocate on their own behalf and feel needless or guilty asserting needs and wants. Caretaking and pleasing give them a sense of purpose and value. Because they feel undeserving of receiving love, they don’t expect to be loved for who they are—only for what they give or do. Without an independent voice, they’re generally passive, compliant, and self-effacing and believe what is said to them is true. They crave being wanted, accepted, supported, approved of, needed, and loved. They may not believe they have any rights and naturally go along or put others’ needs and feelings first, sometimes self-sacrificing at great lengths to please. Like, Echo, this makes them dependent upon the narcissist, even when their needs aren’t being filled. It also allows a narcissist to easily manipulate, abuse and exploit them. Narcissists need partners they can control, who won’t challenge them and make them feel weak. Typically, their partners accept the blame and try to be more understanding. They stay to prevent their greatest fear—abandonment and rejection and losing hope of finding lasting love―and because periodically the charm, excitement, and loving gestures that first enchanted them return, especially if a break-up is imminent. In vain attempts to win approval and stay connected, they thread on eggshells, fearful of displeasing their partner. They worry what he or she will think or do, and become preoccupied with the relationship. They have to fit in to the narcissists’ cold world and get used to living in an emotional desert. It’s easy to fall in love with narcissists. Don’t judge yourself for succumbing, because research showed that strangers’ initial impressions of narcissists for the first seven meetings are positive. They’re seen as charming, agreeable, confident, open, well-adjusted, and entertaining. Their alluring performance is designed to win trust and love, implicitly promising that their attentiveness will continue. Only later did the research subjects see through the narcissists’ likable façade. Difficulties and conflict arise in longer narcissistic relationships. At home, narcissists may privately denigrate the person they were just publicly entertaining, and after a romantic prelude, they act totally different. Once you’re hooked, they lack the motivation to maintain a charismatic façade. As the excitement of romance wanes, narcissists become disappointed in their partner. Their criticisms escalate, and they may act distant and dismissive. The relationship revolves around the narcissist, while others are viewed merely as objects to use in order to manage the narcissist’s needs and fragile self-esteem. Embarrassed partners watch their mate flirt with a cashier, cut to the front of the line, or castigate a clerk or waitress. They must contend with demands, judgments, and self-centeredness. They’re expected to appreciate the narcissist’s specialness, meet his or her needs for admiration, service, love, or purchases when needed, and are dismissed when they don’t. Narcissists put themselves first, and their codependent partners put them first, too. Both agree that the narcissist is great and that his or her mate isn’t and should sacrifice! This makes their relationship work . . . in the beginning. Eventually, the partner feels drained, hurt, resentful, disrespected, and lonely. The children and partners of narcissists share Echo’s experience of feeling rejected, invisible, and unheard. They long to be seen, to have their needs met, and their love returned. Many partners of narcissists sadly pine away for years longing to feel respected, important, appreciated, and cared about. Their self-esteem suffers over time. They risk turning into empty shells of their former selves. Narcissists suffer, too, because they’re never satisfied. Even though Narcissus and Echo both long for love, Narcissus can neither give love, nor receive the love Echo offers. You have more power than you think. Discover How to Raise Your Self-Esteem, find your voice, and how to determine whether your relationship can improve. There are many things you can do to significantly better your relationship with anyone highly defensive or abusive, as described in Dealing with a Narcissist: 8 Steps to Raise Your Self-Esteem and Set Boundaries with Difficult People. This workbook includes a quiz for narcissism and also sets forth criteria that can help you decide if you’re considering ending a relationship with a narcissist. It’s available on my website here as a PDF, at Amazon, Barnes & Noble, and at Smashwords in formats for iPad and other devices.